Chargebacks can indicate that the business is defrauding customers. They may show that a business is providing sub-par services or products with little or no customer support. Businesses could see an increase in their credit card processing rate, cutting into their profits. Researching and refuting chargeback is a drain on a business’s time and resources. There are so many reasons to avoid the hassle and expense of a chargeback, so it’s no wonder businesses will often go out of their way to prevent them from happening. If you are in a high-risk industry, there are a number of things that you can do to help lower your instance of chargebacks and secure a better rate for your credit card processing. Here are a number of things Nationwide High-Risk Credit Card Processing recommends when it comes to reducing chargebacks. Want to Lower the Number of Chargebacks For Your Business? Find out why chargebacks are happening. If you are getting a lot of chargebacks, start tracking the reasons for them. Knowing why the chargebacks are happening it the first step to knowing how to stop them. For instance, if the majority of your chargebacks are occurring because people claim they didn’t agree to a monthly subscription fee, it’s time to address that policy. You might want to have customers sign a contract stating that they agree to the monthly fee or make information about the fee more prominent within your item descriptions so they understand what they are agreeing to pay. If the chargebacks are concerning dissatisfaction with a product or service, you may need to improve them before you continue sales or start managing your customers’ expectations. Give your customers excellent service before, during, and after the sale. This could be the best way to avoid chargebacks. Customers usually only go through the process of doing a chargeback when they feel that they’ve exhausted possibilities with the company itself. Customers are much more likely to approach the seller directly to resolve the dispute than contact their credit card company unless they either don’t know how to contact the seller or the seller is not offering them a suitable resolution. Providing great customer service before and during the sale will make it more likely that the customer will come back to you if they have an issue after the sale, too. Do what you can to resolve the issue directly so the customer doesn’t feel they need to resort to a chargeback. Of course, there are some customers that just aren’t going to ever be happy with you, but good customer service will go a long way with the majority of your customers. Make sure your customers know what they are getting. One of the most common reasons for chargebacks is that the customer feels they didn’t get what they paid for. This could be true for both a service and a product. If you are overstating promises and underdelivering on them, you are putting yourself at risk of a chargeback. You can minimize your risk by ensuring you are being honest and upfront about the product and providing as much information as possible before the sale. For online businesses, this might mean adding content to the product descriptions. Include information like dimensions and provide plenty of photos so buyers aren’t disappointed when the item arrives at their doorstep. Choose a statement descriptor that’s recognizable. When you sign up with a high-risk credit card processing company, you’ll be able to choose a statement descriptor that will show up on your client’s bank statements. Make sure you choose something that they are sure to recognize. It’s best to shy away from the name of a parent company or holding company because the customer isn’t going to automatically associate that name with your business. If they don’t recognize the name, they may not connect it to the purchase and flag it with their bank as a fraudulent charge. That’s bad news for your business because it could mark you as high-risk as cause you to lose the money on the transaction. Choosing a recognizable name will as least put a stop to chargeback investigations and free up some of your internal resources, too. Make your refund policy very clear. Make sure your customers know what your refund policy is and how to get a refund if they want one. Provide that information on the back of your receipts, in your packing materials, at the bottom of confirmation emails, or all of the above and a few more places. This will give your customers the information they need about your policies and refund procedures so they can go through the process themselves instead of resorting to a chargeback. Working with an experienced high-risk credit card processing company can help reduce your chargebacks, too. Looking for one to work with your business? 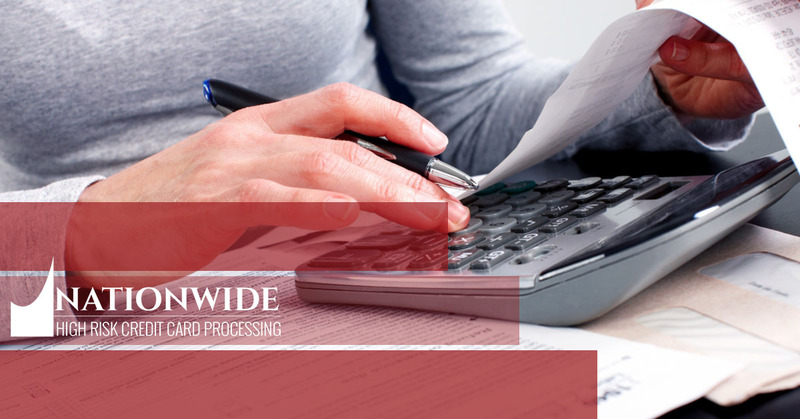 Talk to the team at Nationwide High-Risk Credit Card Processing and discover how we can help your business with competitive rates and the ability to take credit cards despite the fact your business is a part of a high-risk industry. Take our 30-second high-risk evaluation right now through our website to get started.